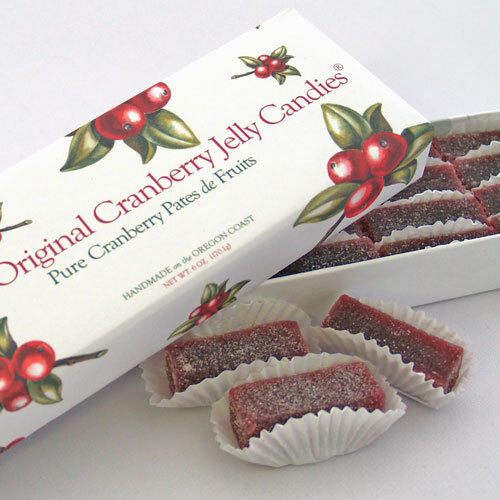 Handmade from the same recipe for nearly 40 years, locally-grown cranberries give these pectin jelly confections their pure, sweet-tart fruit flavor. Refreshing and sophisticated at the same time. Hand-cut into ruby red rectangles, lightly dusted with sugar, and packed in a handsome box. A great hostess gift. Ingredients: Sugar, cranberries and cranberry juice, corn syrup, pectin and tartaric acid. Each 6oz box contains approximately 20 pieces. Very good candy! One of my favorites.